Zone-Reflex: Zooming into a fractal. Counting and hierarchy with primes. Zooming into a fractal. Counting and hierarchy with primes. The basis for adding and counting are partition numbers. Ken Ono and his research team (and number group) have unlocked the divisibility properties of partitions, and developed a mathematical theory for "seeing" their infinitely repeating superstructure. Partition numbers behave like fractals. And they have devised the first finite formula to calculate the partitions of any number. 1. 2. 3. 4. 5. 6. 7. 8. 9. We don’t mean the partition function that is familiar to most physicists. "We prove that partition numbers are 'fractal' for every prime, and are self-similar in a shocking way. They are the number theory equivalent of zooming into a fractal," Ono explains. Video here. Fractals pervade the universe at every level because of their simplicity. They appear to be the most basic way to organize the components of the universe. Expansion through replication of a basic pattern to build, in a sense growing from least to greatest. The same surely occurs with different forms of electromagnetic energy with colors being akin to musical notes in light frequency and radio waves and light like different keys. All built on the oscillations of matter? Or strings? Fractals are mathematical surfaces though. Partitions can be graphically visualized with Young diagrams (also called Ferrers diagrams). Young tableaux have numerous applications in combinatorics, representation theory, and algebraic geometry. They occur in a number of branches of mathematics and physics, including the study of symmetric polynomials, the symmetric group and in group representation theory in general. Our original function p(n) is just p(1, n). Ferrers diagrams showing the partitions of positive integers 1 through 8. They are so arranged that images under the reflection about the main diagonal of the square are conjugate partitions (Wikipedia). 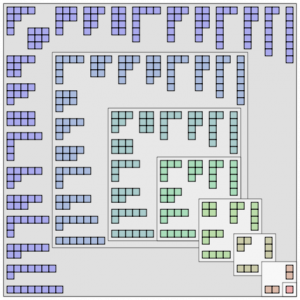 Listing the number of boxes in each row gives a partition λ of a non-negative integer n, the total number of boxes of the diagram. The Young diagram is said to be of shape λ, and it carries the same information as that partition. Containment of one Young diagram in another defines a partial ordering on the set of all partitions, which is in fact a lattice structure, known as Young's lattice. Listing the number of boxes of a Young diagram in each column gives another partition, the conjugate or transpose partition of λ; one obtains a Young diagram of that shape by reflecting the original diagram along its main diagonal. A partition is a way of representing a natural number as the sum of natural numbers (ie. for , we have three partitions, , , and , independent of order). Thus, the partition function, , represents the number of possible partitions of . So, , (for , we have: , , , , ) , etc.. This reveals divisibility properties of the basic partition function that are astounding. Partition numbers are a crazy sequence of integers which race rapidly off to infinity. The amount of partitions for the number 10 is 42. For the number 100, the partitions explode to more than 190,000,000. This discovery unlock the secret of the complex pattern underlying this rapid growth. Here, counts the number of ways to write, , for , where each number appears times. Ken Ono and colleagues, Jan Bruinier, Amanda Folsom and Zach Kent, got results that include a finite, algebraic formula for partition numbers thanks to the discovering that partitions are fractal. The sequences are all eventually periodic, and they repeat themselves over and over at precise intervals. Ramanujan noted strange patterns in partition numbers. In 1919 he wrote: "There appear to be corresponding properties in which the moduli are powers of 5, 7 or 11 … and no simple properties for any moduli involving primes other than these three." (Ono, “The Last Words of a Genius” [pdf]). It is like taking a"walk" through partition numbers. They found the pattern at a hike. “We realized the process of these numbers folding over on themselves is very much like what you see in the woods,” Ono says. “It was kind of a poetic moment,” he recalls of looking out on a mountainous valley, knowing that nature had helped them crack a mystery that had baffled some of the greatest minds in math. "We found a partition function, that we call P, that is like a magical oracle," Ono says. "I can take any number, plug it into P, and instantly calculate the partitions of that number. P does not return gruesome numbers with infinitely many decimal places. It's the finite, algebraic formula that we have been looking for." New theories reveal the nature of numbers video here, over 1hour, but definitely worth to see. Ken Ono, Amanda Folsom, & Zach Kent (2011). l-adic properties of the partition function American Institute of Mathematics. Ken Ono & Jan Bruinier (2011). AN ALGEBRAIC FORMULA FOR THE PARTITION FUNCTION American Institute of Mathematics. There is already an extension on the Ono-Folsom-Kent fractal issue by John Webb called, “An improved “zoom rate” for the Folsom-Kent-Ono l-adic fractal behavior of partition values” [pdf]. Could an ability to always explicitly write down partition numbers translate to physics (see pdf for relevant introduction)? In the past methods developed to understand partitions have been applied to physical problems such as the theory of the strong nuclear force or the entropy of black holes. Asymptotic analysis is a method of describing limiting behavior. The function "f(n) is said to be asymptotically equivalent to n2 as n → ∞", and this is written symbolically as f(n) ~ n2. Does topological defects, etc. explain the same thing, also boundaries? Is this the structure for memory? Intriguing that also savants are extremely talented in computating. This asymptotic formula was first obtained by G. H. Hardy and Ramanujan in 1918 and independently by J. V. Uspensky in 1920. The proof of Rademacher's formula is interesting in that it involves Ford circles, Farey sequences, modular symmetry and the Dedekind eta function in a central way. A special case of an asymptotic distribution is when the late entries go to zero—that is, the Zi go to 0 as i goes to infinity. Some instances of "asymptotic distribution" refer only to this special case. Does this reflect the relation between mass and energy? This is based on the notion of an asymptotic function which cleanly approaches a constant value (the asymptote) as the independent variable goes to infinity; It is often used in time series analysis. The most known result of this field is the prime number theorem. Some results often neglected include the probability distribution of the likelihood ratio statistic and the expected value. Six quadratic equations are generated from the permtuation group on three elements. The six coupled equations are de fined by P2 = P.
Matrices of this form are a subalgebra of the 6 x 6 complex matrices. That is, they include 0 and 1, and are closed under negation, addition and multiplication. They can be thought of as de fining a form of multiplication that operates between two 6-element complex vectors, with 8 classes of solutions. This is merely an “unsurprising” application of the theory of p-adic modular forms and the real breakthrough is in that field. Perhaps we should expect some developments in p-adic string theory. Different small prime numbers have different uses. The way the partition congruences works turns out to depend on the value of [(p-1)/12] – [(p^2-1)/24p] where the square brackets are for the floor function. For 5,7 and 11 this is zero which is why there are many congruences for these primes. For primes up to 31 it equals one, so there are still congruences but they are harder to find. 2 and 3 dont give congruences because they are factors of 24. The sum of 8 positive integers is 31. Make sure it doesn't have 0 in it. 0 isn't positive. But if we don't believe in those dimensions? Would there then be 2(4-1) D? Time is the problematic one? Bosonic time, negative time? Time as ZeroEnergyOntology depending on measurement and consciousness? The basic open question is whether in finite primes relate only to the physics of cognition or whether they might allow to say something non-trivial about the physics of matter too. As above, so below, was an ancient saying. Today we talk of macrocosmos and microcosmos, topology and fractality. A free module over a ring? Like the carbon ring/honeycomb lattice with the zero energy ontology field? Galois groups and modules are the same for both p- and l-adic primes. The general strategy of p-adic Hodge theory is to construct certain so-called period rings. Every discrete valuation ring, being a local ring, carries a natural topology and is a topological ring. The natural expectation is that evolution by quantum jumps means dispersion in the space of these sectors and leads to the increase of the p-adic prime characterizing the Universe. As one moves backwards in subjective time (sequence of quantum jumps) one ends up to the situation in which the prime characterizing the universe was p = 2. Should one assume that there was the first quantum jump when everything began? If not, then it would seem that the p-adic prime characterizing the Universe must be infinite. But the p-adic length scales are finite and if the size scale of Universe is given by p-adic length scale the Universe has finite size. Assumption: the p-adic prime characterizing the entire Universe is literally in finite and that p-adic primes characterizing space-time sheets are finite. The recipe for constructing infi nite primes is structurally equivalent with a repeated second quantization of an arithmetic super-symmetric quantum field theory. At the lowest level one has fermionic and bosonic states labeled by fi nite primes and infi nite primes correspond to many particle states of this theory. Also in finite primes analogous to bound states are predicted. This hierarchy of quantizations can be continued inde finitely by taking the many particle states of the previous level as elementary particles at the next level. It must be also emphasized that the notion of infinity is relativistic. Space-time point becomes in finitely richly structured in the sense that one can associate to it a wave function in the space of real (or octonionic) units allowing to represent the WCW spinor fields. One can speak about algebraic holography or number theoretic Brahman=Atman identity and one can also say that the points of imbedding space and space-time surface are subject to a number theoretic evolution. The Universe of quantum TGD might basically provide a physical representation of number theory? Infi nite integers and reals can be regarded as in finite-dimensional vector spaces with integer and real valued coeffcients respectively. The notion of finite measurement resolution for angle variables given naturally as a hierarchy 2 pi=pn of resolutions for a given p-adic prime defining a hierarchy of algebraic extension of p-adic numbers is central. So we have a relation between integer/reals (bottom-up?) and an algebraic structure containing p-adic numbers? A permutation containing a secondary quantization? This is basically the same structure we use in braidings in genetics (Gaussian-probability). A structure for consciousness as top-down hierarchy, seen also in the music? A topinformational structure of non-entanglement = self? The more far away from the diagonal, the more decay/decoherence of information and energy overlap that brings forth the quantization? In TGD, "selves" are defined as sub-systems able to avoid entanglement with the environment (and hence decoherence) in subsequent quantum jumps. These semi-stable, bound states can be both material (atoms, molecules, organisms) and p-adic (individual mind)- defining an infinite hierarchy of organizational levels and "observers". A spectacular wiev: The most stable configuration is in the middle diagonal of the Young diagram? This is seen in the stable islands of the atoms too, and in the periodic table? The farther away from the diagonal the higher the tension, until it is quantized and vanish out of sight (the Planck constant or alpha changes?) into the dark? TGD as a Generalized Number Theory III: Infinite Primes and the chapter Non-Standard Numbers and TGD of "Physics as a Generalized Number Theory". How babies use number, space and time. “We’ve shown that 9-month-olds are sensitive to ‘more than’ or ‘less than’ relations across the number, size and duration of objects. And what’s really remarkable is they only need experience with one of these quantitative concepts in order to guess what the other quantities should look like,” Lourenco says. development of spatial perception, and how it interfaces with other cognitive dimensions, such as numerical processing and the perception of time. Previous research suggests that these different cognitive domains are deeply connected at a neural level. Tests show, for instance, that adults associate smaller numbers with the left side of space and larger numbers with the right. The findings suggest that humans may be born with a generalized system of magnitude. “If we are not born with this system, it appears that it develops very quickly,” Lourenco says. further study how this system for processing quantitative information develops, both normally and in an atypical situation such as the learning disorder known as dyscalculia – the mathematical counterpart to dyslexia. Reality is always simultaneously analog and digital. This is best understood by using an established branch of mathematics, adelic mathematics, which requires any object or phenomenon to always be understood using both real mathematics (analog) and a specific form of discrete mathematics (digital mathematics) called p-adic mathematics. I have made a highly speculative post on this topic. This is something I have long thought of. Please let me know if it is too much up in the blue. Facts seem to be ok. Speculation about this kind of results is dangerous even for a professional physicist. The results of Ono could have some physical implications for conformal symmetric systems in which partition function involves partition number. But nothing obvious.